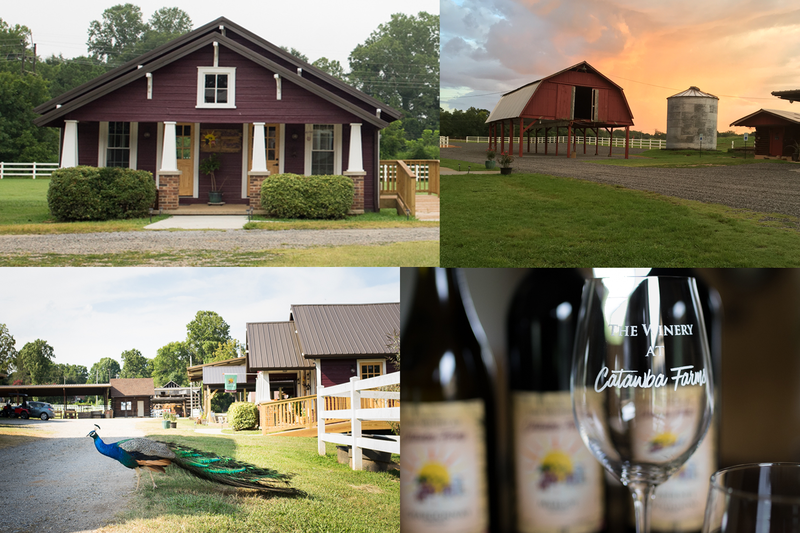 Convenient to Catawba County residents and less than an hour from uptown Charlotte, yet a world away, the 34 acres of Catawba Farms provide the perfect setting for The Vineyard & Winery at Catawba Farms, the first winery in Catawba County. On the property you'll find our tasting room, vineyard, picnic area, farm animals to interact with, fields to wander, as well as the historic Peacock Inn at Catawba Farms bed and breakfast. Our tasting room experience features a guided, curated wine tasting of all of our wines. Besides a tasting, visitors may purchase wine by the glass, bottles, and cases. Food prepared at the farm is available Fridays, Saturdays, and Sundays. 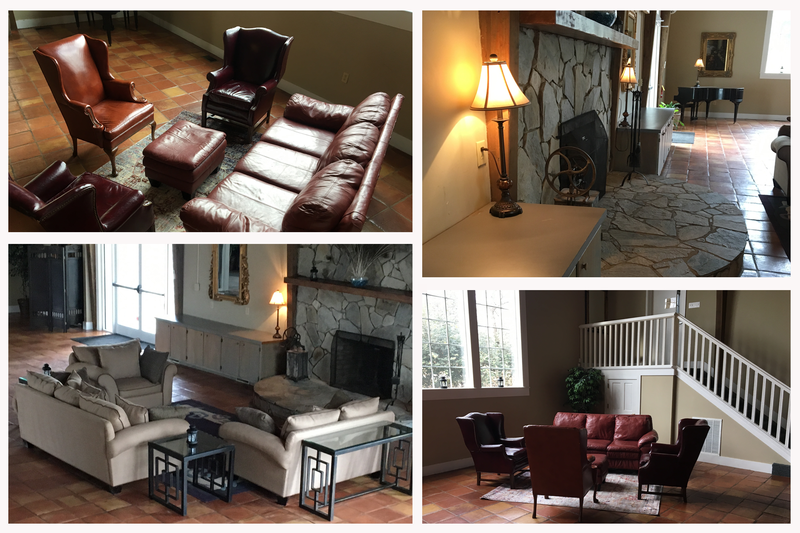 During the winter months our tasting room moves to the Great Hall at the Peacock Inn. Enjoy a lodge-like atmosphere, complete with roaring fireplace. Goats, pigs, chickens, rabbits, a peacock named Henry, a horse named Major Tom, and five barn cats await visitors; the goats and pigs bring smiles to young and old alike, especially when a flat palm stretched toward them contains the goat feed we have available. Guided tours of the property, including a walk through the vineyard to learn about the varietals we have planted and a visit to the Peacock Inn, are conducted Saturdays and Sundays during the summer months. In addition, special tours and tastings are available by appointment. Please call us at 828-994-4766 to make arrangements. Also, if you are planning on bringing a large group, we ask that you please call ahead. The Peacock Inn occupies the core of the old Sigmon farmhouse built in the late 1800’s. Beautiful antiques abound but all rooms have been recently remodeled. It is a five bedroom facility with a large master bedroom and four upper rooms for your stay. Consider booking a room at the Inn to complete a memorable weekend. The Vineyard & Winery is easily accessible from US Highway 321 Business (Southwest Boulevard) in Newton, NC, across from Southside Park. Please enter skowly at 1670 Southwest Boulevard adjacent to the Peacock Inn, then look for signs directing you to plenty of free parking. Nothing beats an in-person visit but make sure to check out our Online Store. Order ahead for pickup at the Farm. Click or tap the basket above. Click the pic to take a look at some of our favorite pictures of the Vineyard and Winery. Send us snaps of your visit and they just might wind up here. Join our Wine Club for discounts, early releases, other benefits. Click to get on our Mailing List. We'll send the occasional email with word about upcoming events, progress reports, and other news from Catawba Farms. For health and sanitary reasons keep all dogs at least 10' from any food or tasting tables. Have a friend hold your dog outside while you are in the tasting room. All dogs must be on a leash — non-releasing/extending preferably. Take your dog for a walk before coming to the Vineyard & Winery. Keep a bag on hand...just in case. Do not leave your dog unattended. Be sure your dog is "kid and people-friendly". The Vineyard & Winery at Catawba Farms is attended by many families. Please be mindful of this. Please remember that not all people love or even like dogs. If you bring a dog to the Vineyard & Winery and it starts barking at customers, biting, or starts a snarl with other dogs, you will be asked to leave. runs from May 30th to Aug 29th. Check out who's playing at Catawba Farms this season.. Convenient to Catawba County residents and less than an hour from uptown Charlotte, yet a world away, the 34 acres of Catawba Farms provide the perfect setting for The Vineyard & Winery at Catawba Farms. On the property you'll find our vineyard and tasting room as well as The Peacock Inn at Catawba Farms bed and breakfast. The Inn occupies the core of the old Sigmon farmhouse built in the late 1800’s. Beautiful antiques abound but all rooms have been recently remodeled. It is a five bedroom facility with a large master bedroom and four upper rooms for your stay. Consider booking a room at the Inn to complete a memorable weekend. Find us at all your favorite social hangouts. © Catawba Farms Enterprises LLC. All rights reserved.